£2.90 plus VAT psf for the Town Houses. £2.80 plus VAT psf for ground floor apartments with individual street entrances. £3.95 VAT psf for all other apartments. Elephant Park is not just about the building of new apartments and houses in the middle of an existing neighbourhood. It is about the actual creation of a whole new neighbourhood and one that puts happiness and healthiness at its core. Split into five distinct zones: South Gardens, West Gove, Park Central, West Grove Square and East Grove. 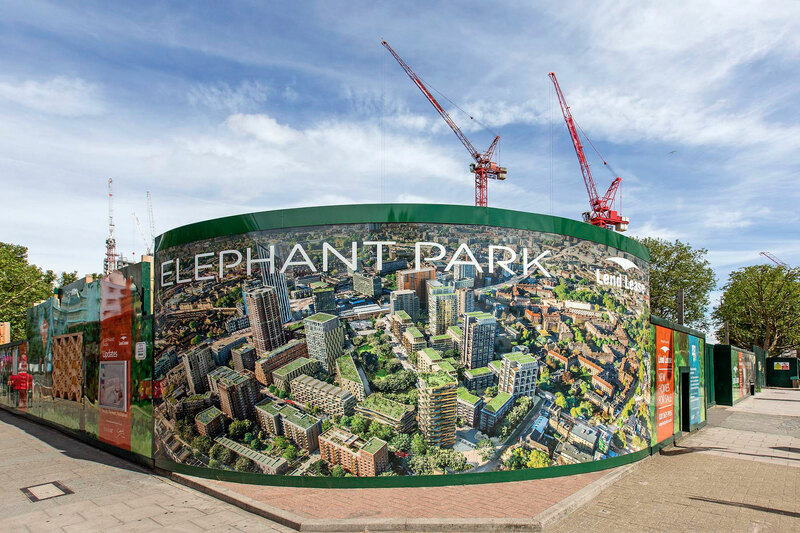 Elephant Park has been meticulously planned to allow people to enjoy the benefits of the regeneration from day one with each phase of the build seeing areas completed and already gaining an individual identity without residents feeling as if they have moved onto a building site. The result will be the largest new park in central London for over 70 years, with family homes, flats for young professionals and a number of wheelchair accessible residences built around this new green space. With nearly 3000 new homes by 2025 Elephant Park will see the regeneration of a long misaligned area of central London, Elephant and Castle, and is touted to become a symbol and model for sustainable living in capital cities the world over. In fact, the developers Lend Lease have gone so far as to say this development at its maturity will actually be mature woodland that just happens to have houses in it! Elephant and Castle is situated in the London borough of Southwark and Southwark itself has long had a reputation for its diversity and vibrancy. Admittedly, this has not always been a positive one but it cannot be denied that it is this rich mix that makes London one of the most exciting cities in the world to live and Southwark has been a integral part of that status. Being immediately south of the City of London and notably beyond its cities walls and therefore out it jurisdiction, Southwark was a veritable playground of debauchery, loucheness and popular culture. A wonderful book entitled ‘The Bishops Brothels’ tells of Southwark’s past as being renowned for prostitutes and harlots and their ‘Madame’ being none other than the Bishop of Southwark. Shakespeare’s Globe was built in Southwark, acting being somewhat of a disreputable profession and was surrounded by taverns, street traders and street entertainment. By the 1920’s Southwark was built-up with rows of houses, mansion blocks and a local economy. Elephant and Castle had a newfound popularity as the ‘Piccadilly of South London’ with a plethora of shops, cinemas, and nightlife. However, post-war Elephant and Castle suffered from poor planning and became somewhat of a concrete jungle with dimly lit high-rise blocks and a dim outlook on the future. However once again, Southwark is regarded as a trendy, chic neighbourhood. With a world famous mix of art galleries, theatres, markets and upmarket bars and restaurants, Southwark is as exciting now as it would have been in Shakespeare’s day, just thankfully less bawdy and much more fashionable. Dahling! Despite its proximity to frankly everything you would ever want to see and do in London, Elephant and Castle in Zone 1, Central London has huge investment potential and properties prices are more comparable with parts Zone 3 London than other Central London districts. The five districts that make up Elephant Park each offer something slightly different. South Gardens, aimed primarily at families, has townhouses and a large proportion of three and four bedroom properties. Buildings are a thoughtful mix of mid, high and low rise blocks creating a small neighbourhood based around internal courtyards and local shops. West Grove forms part of the main central shopping street, the town hall and Walworth Square, making this development a central part of the community with 580 homes split over a number of mid rise mansion block and two taller towers. Park Central, is exactly that, set amongst lots of green space and a shopping street with cafes and al fresco dining Park Central will offer over 600 homes close to the park promenade and leisure facilities. East Grove has been planned to attract small businesses, with over 650 homes and flexible workspaces. Elephant and Castle has long been home to small businesses, creative enterprises and innovative designers. East Grove promises to continue that long tradition. Finally, West Grove, with just 250 new homes will be one of the smallest, most intimate of the new neighbourhoods yet it ‘s proximity to the Elephant and Castle station and a proposed new, outdoor market nearby will still make it very much part of the overall development. It will appeal to those who want all their amenities literally on the doorstep. The whole scheme is trumpeting its green credentials and Elephant Park is one of just 18 cities that is part of the C40 Cities Climate Leadership Group (C40) and aims to create green cities that contribute positively to the environment. However, while each apartment is built to improve energy efficiency, this does not mean a compromise on looks or quality and all apartments have interiors designed around comfort and luxury. Under-floor heating, LED lighting, ethically resourced timber, double-glazing and fresh air filtration systems all add to a life of ease while doing good. Interiors finishes are simply designed in neutral tones offering a blank canvas for you, the occupier. Whether it is to embellish, decorate and create an eclectic nest or maintain a sleek, pared down modern bachelor pad. Every residence in Elephant Park is designed to let you make your house a home. As we described in the ‘brief history’ section, Elephant and Castle is situated in Southwark and is in very close proximity to some of the world’s best cultural venues including, Tate Modern and Shakespeare’s Globe. But Southwark and London as a whole wouldn’t have a reputation for being a ‘cool place to live’ if it wasn’t for the less well known venues, the less well known artists and the more offbeat places. Head further south From Elephant Park, towards Camberwell and you will find the Flux Studios, home to a number of jewellers including the elegant and chic, Miss Imogen Belfield whose creations have graced the pages of Vogue and adorned the necks, wrists and fingers of celebrities worldwide. Just north of Elephant Park is the Gladstone Arms on Lant Street. This tiny pub packs in a loyal crowd who come to listen to the fabulously eclectic bands that play here with honky tonky Wednesdays, folksy Sundays and jazzy Fridays. Towards Waterloo; Jacks Cocktail Bar and Ev, a Turkish restaurant, are always reliable for good food and drinks and closer to home the famous Ministry of Sound night club is still going strong after 15 years having being originally founded by ‘Jamie Palumbo’ now officially titled Baron Palumbo of Southwark. However, let us not forget family life, as Elephant Park is actively encouraging, families and older residents. Local everyday amenities are very good and transport links to anywhere in London are numerous and frequent. Elephant and Castle very easily passes the pint of milk test. And, doctors, dentists and hospitals are all nearby though of course with such a development as Elephant Park transforming the neighbourhood even more of these shops, and services will be provided. Alongside this will be open spaces and recreation grounds for children to play safely as well as mature gardens, trees and plant life all being part of this new urban lifestyle. It is no wonder that Elephant Park has been described as; ‘A wonderful place to bring up children’.